In the early 1970s an innocent teenager who had led a sheltered life was forced to leave her family and enter into a polygamous, abusive, and deviant relationship with a man called the Prophet. In 2008, nearly 40 years later, she fled his religious sect. Property is not a misnomer. It accurately depicts how the women in the sect were treated. 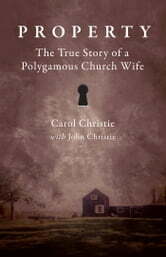 Carol Christie reveals the degradation, abuse, and brainwashing that the Church Wives endured. She exposes the physical abuse, the mental cruelty, the slave labour, and the sexual deviance that took place near Owen Sound, a small community just a few hours north of Toronto, as well as at other locations. She describes the many opportunities that officials had to investigate but walked away from, swayed by the charismatic Prophet. Carol is building a new life, one of freedom and options. With no money and no job she started again and is now dedicated to helping others who have escaped while raising awareness about the dangers of the cult. The book Property is both riveting and appalling at the same time. So many times while reading this attestement to what we do not see around us I wanted to call someone, anyone who could rectify this horror that is going on today. Unbelievable that this is happening...and nobody does anything about it. Just another example of mistreatment of women going unpunished!